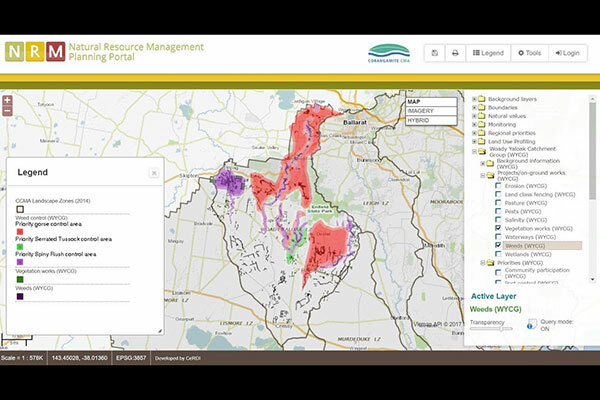 The Corangamite Natural Resource Management Planning Portal (NRM Planning Portal) is an innovative approach to collaborative, integrated catchment management by providing the tools and information for communities and agencies to identify joint priorities for catchment management. 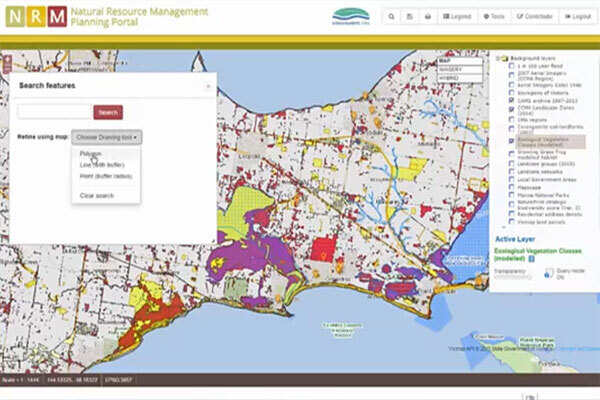 The NRM Planning Portal enables information, knowledge and environmental datasets to be shared, allowing participants to exchange insights about land management in a collaborative online environment. It provides resources and advice on catchment management, agricultural soil management, nature conservation and on-ground activities. The Portal received the 2016 Victorian Spatial Excellence Award, Environment and Sustainability category. The objective of the NRM Planning Portal is to promote the exchange of regional and local knowledge to inform development of natural resource management priorities of key stakeholder groups within the Corangamite region of Victoria. It enables the sharing of information, knowledge and environmental datasets, allowing participants to gain insights and showcase land management activities and outcomes in a collaborative online environment. It provides online resources for groups to develop and share information on local on-ground action plans, drawing upon a wealth of spatial information including regional catchment management, natural assets, biodiversity, monitoring, agricultural soil management and on-ground activities. The project aims to ultimately include all Landcare networks in the Corangamite region. This will assist regional and local organisational planning, priority setting and decision making in areas such as NRM investment. The online spatial documentation of past and proposed future landcare and catchment management works has, for the first time, allowed Landcare networks rapid and easy access to information on their activities and priorities. In the past, this information was only available to a small number of people as hard copy maps, or buried in documents or people’s memories. The process of visualising landcare activities has generated pride in groups at seeing their achievements. It has also helped them identify locations and activities for expanding their program of on-ground works. The NRM Planning Portal is the first time that the priorities for land management, determined at different scales and underpinned by different motivations, can be viewed together over the entire region. This is important in reducing duplication in effort, value-adding to existing works and clearly identifying where and how local and regional priorities coincide to strategically identify future NRM projects and activities. The NRM Planning Portal innovatively combines a suite of simple online data capture and management tools with dynamic visualisation of a variety of spatial datasets, some of which previously did not exist in the public domain. This brings together catchment management information at a range of spatial and operational scales in a manner not seen previously. The NRM Planning Portal will pave the way for improving data standards in the capture and recording of catchment management information. Unifying the way these data are collected and stored, across multiple landcare groups and the CMA, will provide the foundation for NRM planning at larger scales. This will be critical in ensuring that the works and activities of community groups can supplement, and help guide the planning and prioritisation of state and national governments. 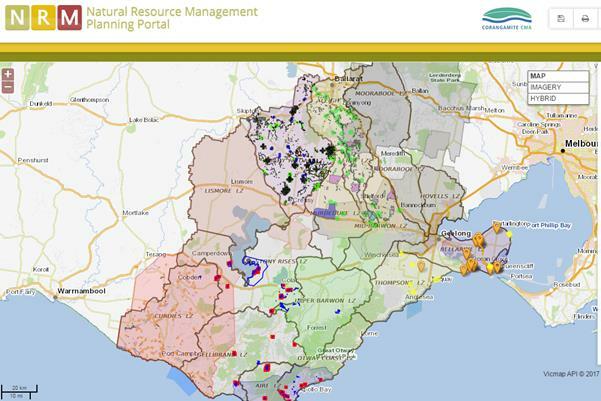 The NRM Planning Portal has a suite of simple online tools for contributing, querying, filtering, editing and downloading local catchment management information. These tools provide intuitive and straightforward solutions to the problem of finding and interpreting multiple spatial layers at a scale relevant to the end user. Landcare networks are provided access through a login to the portal, where they can contribute, upload and manage their data. This feature will improve the ways groups manage information in the future, and reduce systemic problems with loss of data and knowledge through inadequate storage and retrieval mechanisms. 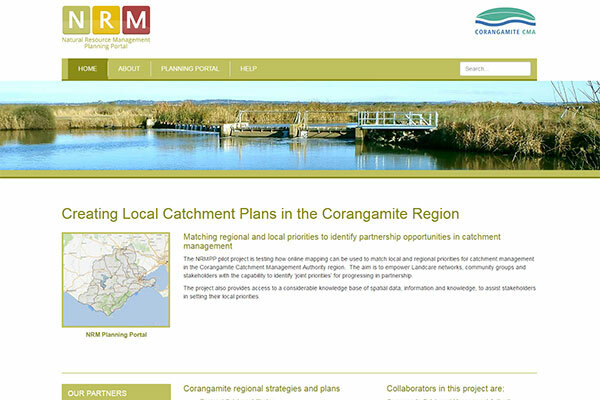 The initial project to develop the NRM Planning Portal was a collaboration between CeRDI, the Corangamite CMA (CCMA), the Woady Yaloak Catchment Group and the Surf Coast and Inland Plains Network. Spatial information was provided on natural assets, past NRM activities, as well as catchment management priorities from both a regional and local perspective, for the two landscape zones. Standardised templates were provided to help guide groups and individuals to develop their on-ground action plans; this also allowed users to more easily quality control their data. The information was arranged so that it can be filtered to particular geographic areas or themes. Using this approach, local NRM priorities determined from Landcare networks and community groups could then be spatially overlayed with regional NRM priorities determined from national, state and regional NRM authorities / managers, to identify joint priorities for potential partnership and investment. 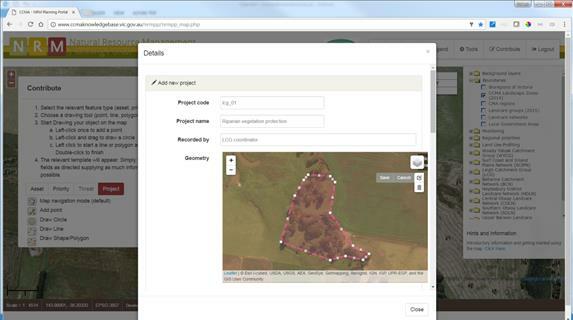 Under the guidance of CeRDI technical staff, the Woady Yaloak Landcare Group digitised and uploaded their on-ground works and areas for future activity as geographic information system (GIS) layers. This process successfully identified where the Landcare group and the CCMA strategic priorities overlapped, thus better targeting complementary priority areas for future NRM activity. These joint priorities will underpin local catchment management strategies and plans. The determination of local NRM priorities involved participation of over 100 members from the Landcare networks. Stage two of the project continues to build on the successes of the project with a further expansion to Landcare networks in eight new Landscape Zones. The NRM Planning Portal will continue to be rolled out across the catchment, and will aim to capture and incorporate the knowledge and information for all Landcare networks with the Corangamite region. Through this process, priorities for local NRM will be spatially represented across the entire catchment, providing a unique opportunity to create the next Regional Catchment Strategy from the ground up through a dynamic digital platform. The NRM Planning Portal will provide a model for NRM planning in other parts of Victoria, and even interstate. The value of sharing knowledge using system will be demonstrated in the co-development of funding proposals between the CCMA and the Landcare networks, ensuring that resourcing is strategically allocated in a manner that has multiple benefits and outcomes. Milne, R., Hansen, B. (2016). Engaging communities for prioritising natural resource management and biodiversity conservation actions (Conference Paper). CEUR Workshop Proceedings 1570, 36-40.